There are many stories out there in which a semi-noble family falls on hard times and ends up living a life of genteel poverty. Oftentimes, it is left to a plucky young girl to go out into the world and either make her way by herself, or help her family rise again. 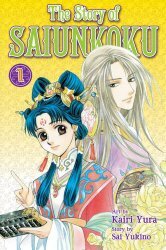 Our plucky young hero is Shurei Hong, and the book is The Story of Saiunkoku Volume 1. Shurei was born the daughter of the Imperial librarian. That's certainly a proper job for a nobleman, but it's also one that doesn't pay particularly well. Shurei has been tutoring youngsters to help make ends meet. She dreams of taking the Imperial exams and take a post in government, to help make a difference in the empire. As women are forbidden from taking the exam, she sees tutoring these kids as her way of making a difference by-proxy, as well as help put food on the table. Even with her outside work, and their only remaining retainer staying on despite not being paid as an act of loyalty, rice tends to be a 'special occasion' food in their household. When the Emperor's Grand Advisor gives her the opportunity to make a very large amount of money in just six months, Shurei jumps at the chance. The mission seems simple enough on its face. She must train the new emperor to lead. This new emperor, though, doesn't seem at all suited to the job. Ryuku Shi, the 6th son of the former emperor, is only the heir due to his father's dying wish, as well as the fact that the rest of his brothers all either killed each other off or are living in exile. As the youngest of a pack of rather devious and brutal boys, he was often beaten by both his siblings and his mother, and locked for days in a dark storage room. He has no desire to lead, and still hopes that his exiled brother - the only person to ever show him any kindness - would return to lead. He believed that the best way to make sure that his brother would be able to take the throne if he came back would be to seem so incompetent that he wouldn't seem a threat. He wandered aimlessly through the compound so that his advisors and tutors could not find him. He even spread the rumor that he preferred men to women, giving people the impression that he would not be able to produce an heir to the throne. So Shurei certainly has her work cut out for her. But she's not one to take a challenge - or the prospect of a payday - lying down. She's headed to the Capitol, and she's going to make something out of this young Emperor if it's the last thing she does. High: The shojo genre is full of plucky young girls determined to get some goal or another accomplished, but the layers of palace intrigue and a possible assassination plot give this story more depth than others. Lows: The art, while well done, has a very generic, feminine fell to the men, to the point that it can be a bit hard to tell people apart. Verdict: Better than many shojo titles, but still firmly of the genre.